A short tournament can set the stage for a goaltender to shine and carry his team to the title. Some stages are bigger than others. In the NCAA tournament, which kicks off this Friday at four host sites around the country, it only takes four wins to create a lasting legacy. And that’s where Hayden Hawkey is poised to step into the spotlight and steal the show for the Providence College Friars. The 6-foot-2, 181-pound goaltender has been the epitome of consistency throughout his college career. Over the past three years, his goals-against average has sat below 2.19, while his save percentage has been above .913. This year, Hawkey posted 22 wins in 38 starts, with a 1.89 GAA and .919 SV%. The Friars are making their 6th consecutive appearance in the tournament, but this one wasn’t an easy ticket to punch. After losing to Boston College in a three-game series in the Hockey East quarterfinals, the Friars, #11 in the USA Hockey Magazine/USA Today Men’s College Hockey Poll, had to wait and hope for help to make the field of 16. Selected as the No. 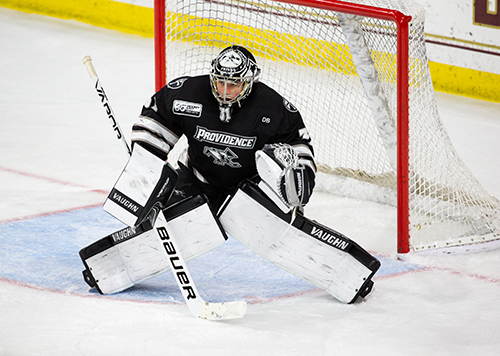 4 seed in the Providence region, the Friars are tasked with taking on No. 1 seed Minnesota State, which led the nation with 32 wins this season. Providence will have to upset No. 1 seed Minnesota State, as well as top the winner of Northeastern-Cornell to reach the Frozen Four. Hawkey, the program's leader in games played, wins and shutouts will have to be up to the task. Led by 2019 U.S. National Junior Team head coach Mike Hastings, the Mavericks scored the fifth-most goals-per-game in the nation (3.51) while allowing the fewest (1.71). However, it is worth noting that while the Mavericks led the nation in wins, with 32, they only went 2-4-1 against Top 20 opponents. 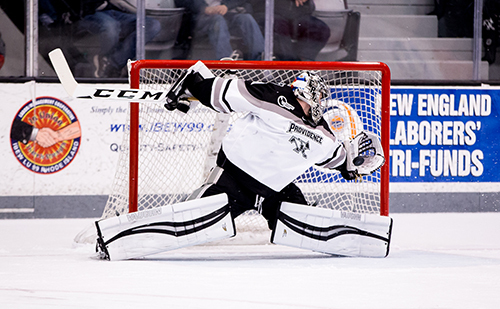 Backed by Hawkey, the Friars tied for the fourth fewest goals allowed in the NCAA, giving up a miserly 1.97 per game. It’s also a team loaded with talent. The Friars boast nine players whose rights are owned by NHL teams, which is nine more than the Mavericks can claim. Over the course of his time on campus, Hawkey has become the program’s record holder in career wins (70), career shutouts (15), single season shutouts (7, T-1st in NCAA, this year) and career games played (122). Providence associate head coach Kris Mayotte, who does a lot of work with the goaltenders, has seen Hawkey’s game develop first-hand. “It starts with his work ethic for sure,” Mayotte said. “When he came in, with any freshman it’s learning how to work and putting in that work on a daily basis. His work ethic is what attracted the Edmonton Oilers to swing a deal this past summer with the Canadiens to acquire the goaltender for a 5th round pick in the 2019 Draft. 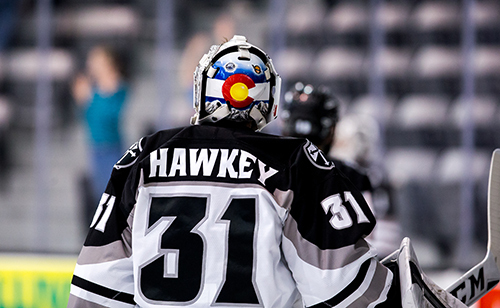 A native of Parker, Colo., Hawkey played his youth hockey with the Colorado Thunderbirds organization. However, whether he signs with Edmonton or patiently waits until Aug. 15 and pursues free agency is currently on the back burner. There are more pressing issues staring him in the face. The focus now is on getting hot at the right time. The Friars are 5-4-1 against Top 20 teams, with all five of those wins coming in the past two months, courtesy of a sweeps of Northeastern and UMass Lowell, and a defeat of Massachusetts. Sounds like the Friars are heating up. Providence’s lone Div. I title happened back in 2015, a year before Hawkey stepped on campus. That year, the Friars also manned the No. 4 seed in the Providence region. So, look out.